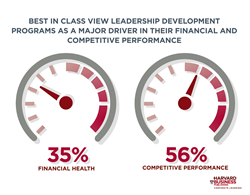 A new report from Harvard Business Publishing shows that while only 7% of organizations have leadership development programs that are considered Best in Class, these programs are shown to have a strong impact on a company's financial performance. However, a gap exists between L&D teams and their business partners on the relevance and effectiveness of leadership development programs. Best in Class leadership development programs have an impact on financial and competitive performance. There is a big silver lining here: leadership development programs, when they work, absolutely have an impact on business success. Harvard Business Publishing Corporate Learning, developer of world-class leadership development solutions for global companies and organizations, today announced the results of their State of Leadership Development Survey. The survey revealed that only 7 percent of organizations feel they have a Best in Class leadership development program. The survey also examines how learning and development (L&D) teams and businesses managers perceive leadership development and found that a perception gap exists between L&D and the rest of the business on the relevance and effectiveness of leadership development programs. A copy of the full report is available for download here. For a majority of organizations, leadership development is still not considered a “business critical” investment. Many programs are missing the mark when it comes to relevance and innovation. Top barriers to success include time constraints, lack of funding and defendable ROI. Best in Class programs represent only 7 percent of organizations surveyed, and can be found in large public organizations with more than 10,000 employees in the aerospace, pharmaceutical, and consumer goods industries. Even among Best in Class programs, 40 percent of respondents feel that leadership development is only important – not fundamental – to business strategy. Demonstrating integrity (77 percent) and managing complexity (75 percent) were the highest rated critical capabilities for leadership, though end users are less convinced that current programs are developing these capabilities enough. Best-in-class leadership development programs share three key traits: business priority, financial impact and C-level support. Additionally, these programs are equally available to leaders across the organization – from C-level executives through new managers. But even Best in Class programs struggle with both measurement and innovation. 50 percent of Best-in-Class companies consider leadership development a strategic priority, as opposed to only 28 percent of all other groups. Nearly half of best-in-class organizations believe they have a strong pipeline of internal candidates. Three-quarters of best-in-class programs enjoy strong CEO support, as opposed to only half of all companies. As many Best in Class programs agree (42 percent) as disagree (40 percent) on their ability to measure program impact. The majority of business managers and L&D professionals aren’t seeing eye-to-eye on the impact or relevancy of leadership development programs. Harvard Business Publishing Corporate Learning surveyed over 700 people, including both L&D professionals (44 percent) and business managers (56 percent) over two weeks in November 2015. The majority came from large enterprises (10,000+ employees) and represent senior management most heavily, followed by mid-level managers. Almost all (90 percent) have attended a leadership development program, over half in the past year. Harvard Business Publishing Corporate Learning partners with clients to create world-class leadership development solutions for managers at all levels. We leverage the management insight, thought leadership, and expertise of Harvard Business School faculty and authors from Harvard Business Review to create tailored leadership development solutions. With more than 20 years of practical experience, our innovative, technology-enabled solutions drive meaningful and lasting business results. Corporate Learning is a market group within Harvard Business Publishing. For more information, visit http://www.harvardbusiness.org. Follow us on Twitter @HBPCorpLearning and connect with other leadership development leaders on LinkedIn through the Harvard Business Publishing Corporate Learning Group.